The radius is one of the two bones that make up the forearm, the other being the ulna. It forms the radio-carpel joint at the wrist and the radio-ulnar joint at the elbow. It is in the lateral forearm when in the anatomical position. It is the smaller of the two bones. The proximal radius consists of the radial head, neck and tuberosity. 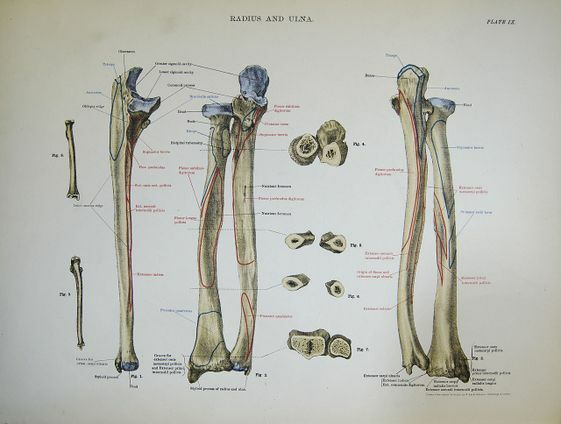 The radial head is cylindrical which articulates with the capitellum of the humerus. The head rotates within the annular ligament to produce supination and pronation of the forearm. The neck and tuberostiy support the head and provide points of attachments for supinator brevis and biceps bracii. The shaft of the radius is slightly curved into convex from the body. The majority of the shaft has three borders: anterior, posterior and interosseous. The radius' main functions are to articulate with the ulna and humerus at the elbow to provide supination and pronation. Then to articulate with the lunate and scaphoid to provide all the movements of the wrist. 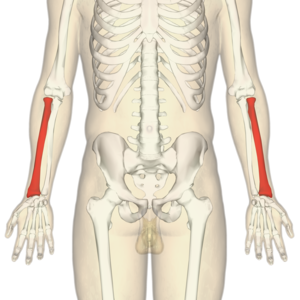 The radius articulates with the ulna in a synovial pivot joint. The radial head rotates within the annular ligament and radial notch on the ulna to produce pronation of the forearm. The radius articulates with the first row of carpel bones: mainly scaphoid laterally and the lunate medially to form the radio-carpel joint, triquetral only makes intermittent contact on ulnar abduction. The radio-carpel joint is an ellipsoid joint whereby the scaphoid, lunate and triquetral bones form a convex surface to articulate with the distal radius' concavity. The radio-carpel joint has four movements: flexion, extension, radial and ulnar deviation. Biceps bracii attaches to the radial tuberosity. Supinator, flexor pollicis longus and the flexor digitorum superficialis attach to the upper third part of the shaft of the radius. Pronator quadratus muscle and the tendon of the supinator longus attach to the distal quarter of the radial shaft. Radial head fracture: commonly caused from FOOSH this can be accompanied by dislocation of the radius and/or ulna which can complicate the management of this injury. Radial dysplasia or radial club hand can occur in paediatric patients as a congenital condition whereby there is a shortening of the radius or even complete lack of radius in the forearm. This can lead to thumb abnormalities and the need for surgical intervention to improve function. ↑ Cohen MS, Hill Hastings II. Acute elbow dislocation: evaluation and management. JAAOS-Journal of the American Academy of Orthopaedic Surgeons. 1998 Jan 1;6(1):15-23. ↑ Bednar MS, James MA, Light TR. Congenital longitudinal deficiency. The Journal of hand surgery. 2009 Nov 1;34(9):1739-47.